To view all colors available: Choose a color and size option or select “Colors and Options” from the Design Studio. Traditionally styled for dress or casual wear, this sheepskin coat fits the bill for all occasions. Over-sized pockets, a shawl collar and 3″ roll cuffs finish this shearling jacket. Leather bound-buttonholes and handcrafted antler buttons keep this coat securely closed against all weather conditions. With it’s longer length this coat works well on taller women! All of our sheepskin coats are custom made to order. If you require a size not listed we can do it: Please call to discuss (719-836-3383). Collars, cuffs and pockets may be interchanged on most coats. Please be aware that sheepskin is a natural product and as a result, each hide may be slightly different in texture from the next. You might see marks on your product. These are not defects or blemishes. They are just part of the natural hide and makes each piece unique. Also, keep in mind that each computer monitor and printer will show these colors a little differently, as well as each dye lot may be slightly different. Additional Charges Apply for Antique, Napa and Brisa Finishes. After ordering, please submit a Fitting Sheet in the Design Studio. This sheepskin coat is cut generous through the shoulders and body. It is also cut 2” longer than most of our other shearling coats. Because of the yoke in the front and back it works better on a taller, larger frame body. If you need to order a size larger than 14 or longer length in the body or sleeves, additional charges may apply. Upon wearing, our sheepskin garments will mold to your body but they will not stretch or shrink. After ordering, please submit a Fitting Sheet from the Fitting Room. To view all colors available: Choose a size option and a color option or select “Colors and Options” from the Design Studio. 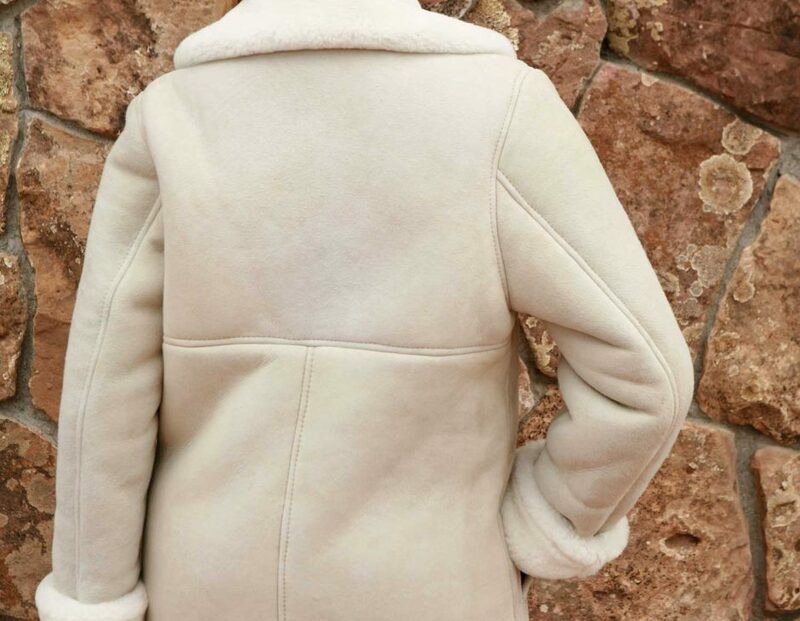 Waist-hugging feminine lines make the Columbine sheepskin jacket an elegant piece of shearling comfort. It features princess seams on the front and back with wool trim down the front and around the bottom. This shearling coat has a notched collar and 3″ rolled cuffs keep away winters chill. Perfect jacket for a night out on the town. This jacket is very trim fitting and runs on the small side. This sheepskin earband is the ideal shearling headwear for those who don’t want to wear a hat in cool weather. It is extremely comfortable while being stylish at the same time. It features a soft elastic back to make the fit more comfortable. It fits easily into your pocket to bring out when the wind kicks up or the thermometer drops. This sheepskin accessory is perfect for any winter activity! Please be aware that sheepskin is a natural product and as a result, each hide may be slightly different from the next. You might see marks on your product. These are not defects or blemishes. They are just part of the natural hide and makes each piece unique. Also, keep in mind that each computer monitor and printer will show these colors a little differently. This beautiful ladies shearling coat features finished seams all around to make it an extremely versatile coat. Town or country this coat is just the ticket with it’s mid thigh finished length. The shawl collar and 3″ rolled cuffs on this sheepskin jacket will keep you warm and toasty all day long. Finished with bound button holes and handcrafted deer antler buttons, this is our most popular ladies coat. Do You Know The Facts About Shearling? Copyright The Sheepherder 2012 - Made by Hand. Worn to Perfection.